A dramatic, fresh impact crater on Mars dominates this image taken by the High Resolution Imaging Science Experiment (HiRISE) camera on NASA's Mars Reconnaissance Orbiter on Nov. 19, 2013. Naming landmarks on Mars isn't just for scientists and rover drivers anymore. Starting today (Feb. 26), anybody with an Internet connection and a few dollars to spare can give a moniker to one of the Red Planet's 500,000 or so unnamed craters, as part of a mapping project run by the space-funding company Uwingu. Putting your stamp on Mars isn't free. Naming the smallest craters will set you back $5, with prices going up as crater size increases. Uwingu will use the money raised by the project — which could be more than $10 million, if people name every available Martian crater — to fund grants in space exploration, research and education, which is the company's stated chief purpose. "We're developing this grant fund — the Uwingu fund — for people who've been hit by sequestration," Stern told Space.com. "There's nothing like it right now. They have no place to go; it's either NASA, NSF [the National Science Foundation] or you're out of luck." The project could also provide a sort of cultural snapshot, revealing what people are thinking about and what's important to them at this moment, he added. "It's like taking a picture of ourselves," Stern said. "What will people put? Will there be a lot of craters named for politicians? For artists, for relatives, for places on Earth? Sports teams?" The crater-naming project is not a contest, working instead on a first-come, first-served basis. Names will be accepted immediately and will remain approved unless Uwingu officials later determine them to be profane or otherwise offensive. Stern stressed that Uwingu (whose name means "sky" in Swahili) is not trying to supplant other Mars maps, such as the one generated by the United States Geological Survey. The 15,000 Red Planet features whose names have already been approved by the International Astronomical Union (IAU) will be grandfathered into Uwingu's base map, officials said. This is not Uwingu's first foray into celestial-object naming. The company has also raised funds by asking the public to choose monikers for the thousands of exoplanets and exoplanet candidates being discovered around the galaxy, including Alpha Centauri Bb, the closest alien world to Earth. IAU officials expressed disapproval of these previous projects, asserting last year that the exoplanet-naming efforts misled people into thinking they were helping select officially recognized names. But Stern fought back hard against this claim at the time, saying that Uwingu has always made clear that the projects sought only to choose "people's choice" monikers. 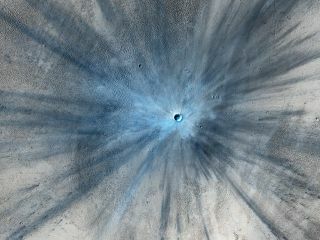 To learn more about the Mars map project, and to buy a crater name of your own, go to www.uwingu.com.